I lost something precious, valuable and irreplaceable today. Not a friend, family member or my health; so inconsequential in the scheme of life. I hope if it's found the new owner will take more care of it. sometimes it's a payoff for something that is more important. also, some things are just meant to be for us for only a time. move on, 'tis the best we can do. you may have lost something...but it certainly is not your wonderful vision. sorry to hear. maybe something better is on it's way. this is a beautifully graphic image. Nice b&w shot; great lines and interest. Sorry about your loss. Oh dear, doesn't sound good, but you have a fabulous photo here though. Can you retrace your steps and maybe find the lost item. fav. The irreplaceable bit is the saddest! I hope you have lots of good memories to hold onto. This is an amazing photo! Great image Jackie, but I'm sorry to hear that you have lost something that you treasured. Love these lines! But so sad reading your narrative. @pistache it's only an item! @amyk it is a lovely staircase, saw it had to photograph it!! @wendyfrost even crouched down and clicked my knees!! @grammyn keep fiddling with wrist but bracelet not magically reappeared!! @kali66 it was the lurch I felt when I realised it had gone! Thank you all for liking my staircase. We went to see Don McCullin's exhibition at The Tate. If you're in London do go, it's well worth the £20.00 but very, very shocking. Great pov and lines. Fav! A wonderful, artistic view of this stairway. Sorry for your loss. Sometimes things that might be insignificant to others are priceless to us. Wow...what a staircase! I do not like to lose things...unless it is in my house and it will eventually find me again when I am not looking. A great photo fav. 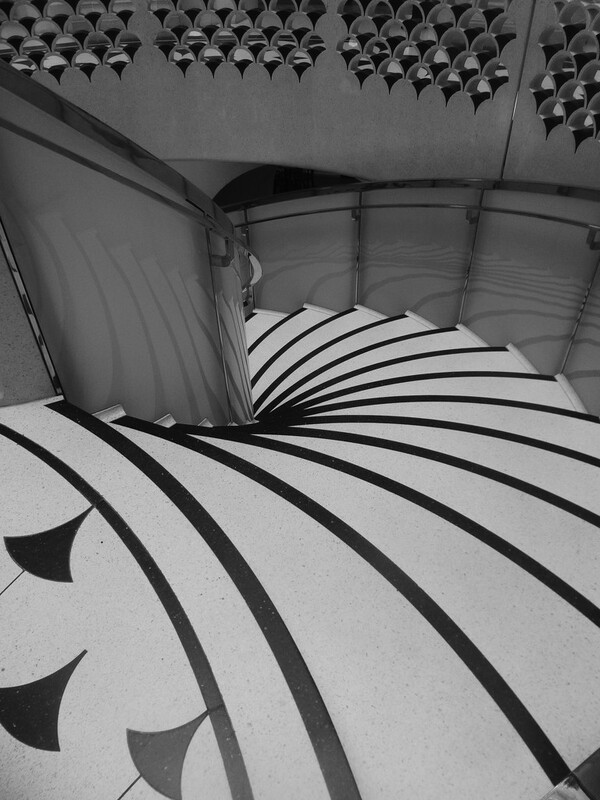 A great spiral shot - wish we had more staircases like this! So sorry you lost your bracelet - a sad time indeed.